Proposed safe staffing legislation for Scotland requires more clarity on who takes responsibility for setting workforce levels, a parliamentary committee has said. The Health and Care (Staffing) (Scotland) Bill was introduced in May this year, and the Scottish parliament's health and sport committee was asked to review stage 1 of the bill and produce a report. The committee, made up of cross-party MSPs, says it supports the general principles of the bill, but that more information is needed to allay concerns raised by some organisations over where responsibility for safe staffing levels rests. The bill does not mandate minimum nurse-patient ratios, but it does require NHS boards and care services to use nationally agreed nursing and midwifery workload and workforce planning tools. The MSPs highlight that most witnesses who gave evidence to the committee raised concerns that the bill was being introduced into a workforce context already under pressure from recruitment and retention problems. RCN Scotland director Theresa Fyffe said: ‘The RCN is pleased to see that the committee is recommending the general principles of the bill. Front-line nursing staff know the time is right for legislation on staffing levels to provide safe, high quality care. In September, RCN Scotland launched the Ask for More campaign to raise public awareness and input about the bill. 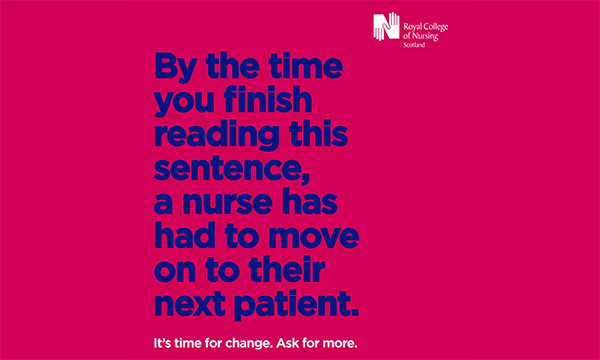 The campaign sets out six key tests which the legislation should fulfil, one of which is allowing nurse leaders to be able to exercise their professional judgement about whether they have the right number of nursing staff with the right skills. MSPs are due to debate stage 1 of the bill in the Scottish parliament on 6 December. In April this year, Wales became the first country in Europe to implement a safe staffing law for nursing.